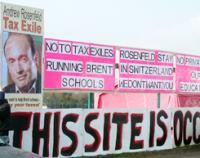 Protestors have occupied Wembley Park sports field in an attempt to prevent the construction of a City Academy. The protestors, including teachers, parents and sports ground users have set up tents on the field with the intention of staying there permanently until the proposal is dropped. Funded by the DfES and private sponsor Andrew Rosenfield, the Academy was approved in January by Brent Council and would sit on what is currently Bridge Road Recreation Ground. "Brent Council are refusing to consult on whether the proposal should go ahead or not. This is a travesty of democracy and governance by dictat. No wonder people have had to resort to direct action. I call on all who believe in and value state education to come to the site and support the occupation." "We have had seven football matches here over the last three days from primary school girls and boys to young lads and a men’s game. I keep the pitches up to scratch, free of charge, for the benefit of young and older footballers. Brent schools are heavily involved here and despite the Liberal Councillors saying that they will keep it for community use, I know through experience that this will not happen." "I and local residents oppose this proposal because; of the traffic chaos it will bring to the already congested area; it will turn Barn Hill into an overflow car park for the school users and the area is already well served by several good local comprehensives including one only 500 yards away. Also, the residents south of the North circular are going to be very badly served by this location, there are alternatives!"